Style of the week is the fabulous 'Dollierocker Op Art' dress! This fabulous Madcap England 1960s inspired dress features an amazing swirling Op Art design with a cute Mod Peter Pan collar. 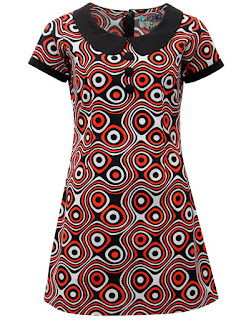 Oozing in 60s Mod styling this dress is sure to look amazing all year round! 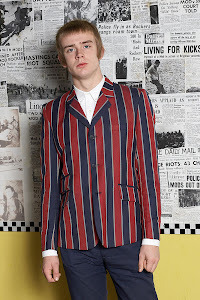 Madcap England 'Dollierocker Op Art Dress, also affectionately known as the Dolliericker Dazzler! Like a 13th Floor Elevator's album cover, this swirling Op Art pattern Mod dress is most definitely going to catch the eye. 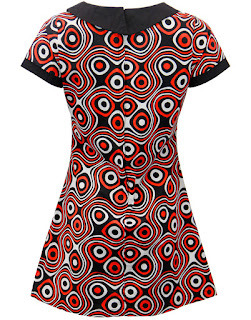 With Retro covered button detailing and Sixties Mod Peter Pan Collar, this version of the iconic 'Dollierocker Op Art' Dress features a gorgeous tri-colour printed fabric and classic A-line shape. The perfect party dress - a real eye catcher!